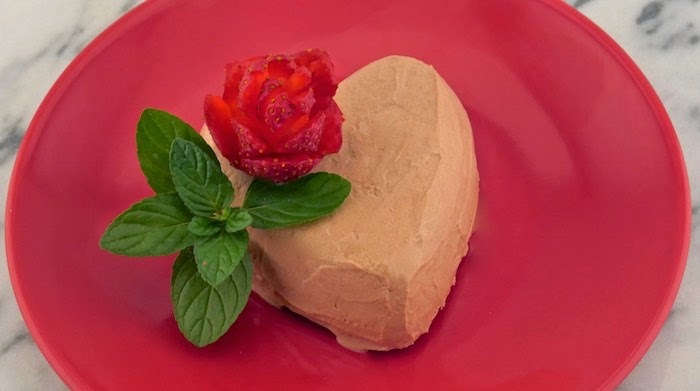 Valentine's Day is right around the corner and while I love to indulge in chocolate, I wanted to make a dessert that wasn't loaded with extra calories. Chocolate Yogurt Semi-Freddo is easy to make and by substituting half the cream found in traditional semi-freddo for Greek yogurt it becomes a great way to get my chocolate fix without feeling guilty. In the bowl of an electric mixer, using the wire whisk attachment, whip the heavy cream and sugar until you have whipped cream with stiff peaks. Gently fold in the cocoa with a spatula. Divide the mixture into prepared ramekins, smooth the tops, and cover with plastic wrap. Place in the freezer for at least 4 hours, or until the semi-freddos are firm. This can be done in advance. When ready to serve, place each ramekin into a bowl of hot water. Slide a butter knife along the edges and invert over a serving dish. Smooth the semi-freddo if necessary. Serve with fresh berries. What an easy yet elegant dessert -- love the inclusion of yogurt, too. Would love this yogurt dessert. i've never thought of doing something like this with yogurt! yum. I love that you lightened this up! What a pretty dessert for Valentine's Day, or any other day of the year. I never would have thought of using yogurt! Looks yummy! This is my kind of dessert! Love that it's a little lighter from using yogurt! Guilt is such a horrendous thing. Good thing you came up with this delicious dessert so 'guilt' is not a worrisome factor! I'm all for a little bit of a lower calorie Valentine's day dessert! Yum! Lighter! I'm in love now! This looks absolutely delicious! I really like the way you garnished it too. Perfect for Valentine's Day! I love how simple, yet incredibly luscious, this is! A chocolate dessert with no extra calories, Yes please! Sign me up! Looks great! Lightened up semmifreddo! Yes, girrrl! It's beautiful! This dessert looks so delicious and CRAZY easy! Love that it's made with creamy Greek yogurt. I love the simplicity of this dessert and chocolate is always a home run in my house. A nice lite way to end a great meal! Sorry, but when should the yogurt be added--I don't see in in the instructions. I love greek yogurt but would never think of using it in semi freddo. Looks delish!